This is a easy and versatile recipe, with the egg base, you can choose to add any ingredients of your choice like ham, bacon, chicken, broccoli, asparagus, corn and the list goes on. Very kid friendly as well. In a pan heat up some butter and the onions and garlic till fragrant, add in the mushroom and cook in medium heat for 2 to 3 minutes till the mushrooms have soften. Season with salt and pepper. 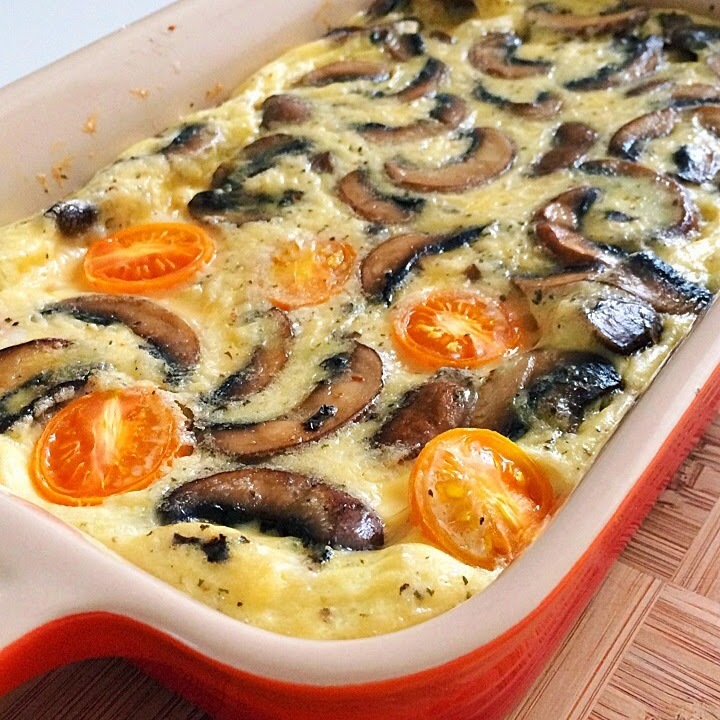 Pour the mushroom and egg mixture into your baking tray, stir to even spread the mushroom. Add in the tomatoes. Bake it in the oven at 170c for about 20 to 25 minutes. Press the centre of the frittata, it should be firm to the touch when done. You can sprinkle some cheese on top if you like it to be more cheesy. Let it cool for a few minutes before cutting.